Our next-generation 2.ZERØGRAND Plain Toe Oxford offers a remarkably innovative upgrade on tradition and seamlessly integrates craftsmanship with features that rival top-of-the-line running shoes. Integrated Motion Outsole, Flex Welt, and soft suede support unrestricted movement and flexibility. Love these shoes. I have multiple pairs and wear them daily. Love this shoe! Comfortable, light with a great sole. The shoe is true to fit and wears well. Still very comfortable after ten hours. There is nothing more comfortable than Cole Haan shoes. Amazing pair of shoes from Cole Haan. Looks great and is honestly comparable to Boosts in terms of comfort. The heel of the shoes stings a little when you wear it with shorter socks, but long socks fix that. Small price to pay for amazing shoes. It’s a very good looking shoe! My son in law wants them for Christmas. We love to purchase from Cole Haan. They are very good quality shoes. this is my second pair of this style. great shoe! I saw a guy at a car wash with a pair on a few months ago. Just arrived, but Love these shoe comfortable and received many compliments. First thing is I liked the style. Then I read the reviews and the majority of people who purchased them said they were extremly comfortable. My son wears cole Hans and wanted a new pair for Christmas. Casual and dressy all in one. My son loves his Cole Haan moccasins and has worn them for years! He has asked for these shoes for Christmas! Cole Haan shoes are extremely comfortable while also looking good. The color and I'm impressed with the comfort of my 3 other pair of Cole Haan shoes. Looking for an amazingly comfortable shoe. 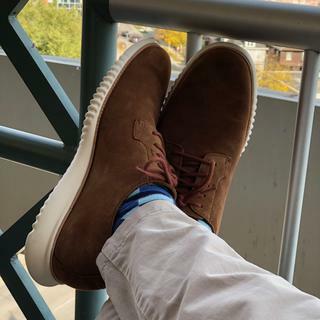 Something we need more "normal" casual pair of shoes for work or social events. I find sometimes Cole Haan can be a little too formal or too casual/athletic. These pair seem to be in the middle! To match with my boyfriend's spring and summer outfit. I had same one in the past. It was very good. Saw it at the store and liked it! Perfect for kicking around with friends. BEST ANSWER: The insole of our footwear is usually permanently secured to the footbed of the shoe. Our footwear is not designed to accommodate orthotics.